The center of town! It reminds me of The Amalfi Coast in Italy! People from all over the world (not just LA) travel to Catalina for a weekend adventure or a simple day getaway. Believe it or not, there are cruises that stop over in Catalina for a day on their way to Mexico. The easiest and most convenient way to get there is via The Catalina Express. There are a few different ports you can choose from including Long Beach, San Pedro, Two Harbors and Dana Point at a cost of $75 round trip (ages 12-54). It’s not cheap to say the least BUT it is only an hour boat ride to get there and most of the time along the way you can see pods of dolphins or even a few seals! You can view all of the information for times and fees HERE. It’s a lovely way to travel and the ride is usually pretty calm. I am one of those people who gets seasick very easily so if I can handle the ride, so can you! Relaxing and wind blow on The Catalina Express! How cute is this nautical dress from Anthropologie! If you’re looking for spectacular views in a sleek, modern hotel that’s in a wonderful location in the downtown area, look no further than The Aurora Hotel. As you walk in you will see the cutest lobby filled with young patrons and in the mornings they offer a complimentary breakfast spread available until 10am. I stayed on the third floor with views overlooking The Avalon Harbor and of the rolling hillside that was incredibly green due to all the rains we had this past winter. The room was delightful and had the most comfortable bed (in all honesty, I didn’t want to get up this morning because it was so nice). They offer a variety of rooms including Standard Rooms, Junior Suites, and Regular Suites depending on your budget. They provide soft robes, a refrigerator with water, complimentary Wi-Fi and a lovely bottle of wine (available for purchase for $20) and, being the wine lover that I am, had to partake. They gave me the warmest welcome upon my arrival and the staff was incredibly friendly and hospitable. In addition to the lovely rooms, they have a rooftop terrace that contains lounge chairs, daybeds, and umbrellas for those who want to unwind and relax while looking down at the city and ocean below. I am a big fan of boutique hotels when I travel and this hotel is definitely at the top of my list. It’s their way of welcoming you to the island. How amazing is that! All in all, I would give it a 5 star rating and I would definitely stay with them again! Wonder Fact: The Aurora hosts a complimentary wine and cheese reception every Friday night for all of their guests. Lounging around on their amazing rooftop terrace! How adorable is the lobby!? Loving this view and this dress! Anthropologie is killing it for spring! My lovely room on the 3rd floor! The view from the rooftop terrace! All smiles over here at The Aurora Hotel! There are palm trees everywhere! MY FAVORITE ACTIVITIES ON THE ISLAND! Catalina Divers Supply - If you love the ocean as much as I do (and aren’t afraid of it), then snorkeling is a must when visiting Catalina. There are a few different areas to snorkel in and around the island like Dive Park and Lovers Cove. Both are spectacular places for getting up close and personal with beautiful and colorful marine life. FUN FACT: When you rent your snorkel gear, ask to get fish food. I learned from a local that if you bring the food with you in the water, it will attract a ton of fish and make it more fun for your underwater adventure. This company, Catalina Divers Supply, are the best for rental equipment. Go check them out! 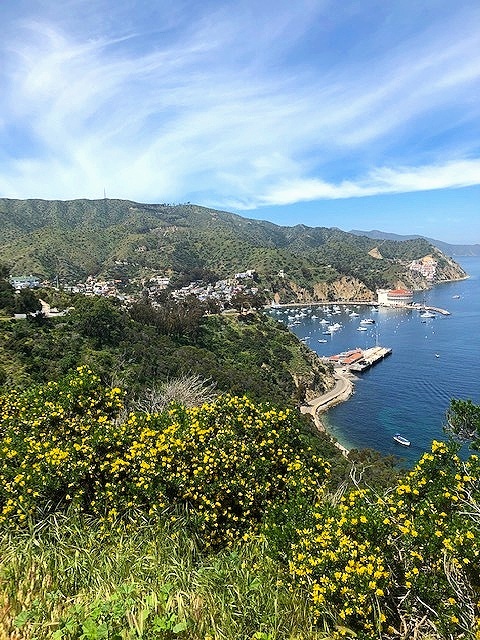 Wonder Fact: Catalina is well known by divers for their vast underwater kelp forests. You will need a wet suit as the water is pretty chilly. 2. 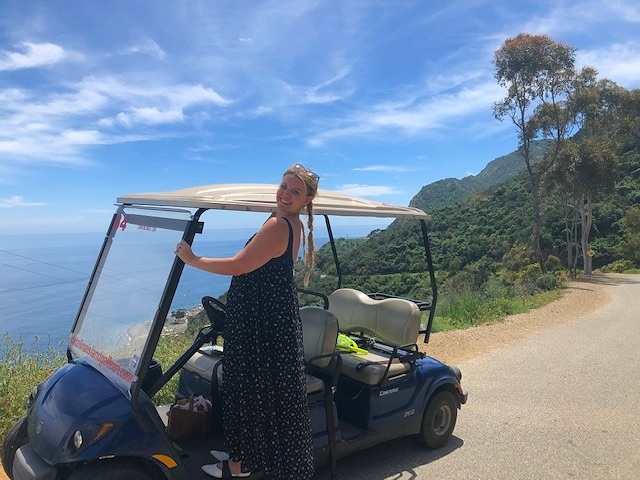 Golf-Carting around the island - Generally speaking, cars are prohibited on Catalina so you need to find other ways to get around the 22 mile island. One of the best ways to tour the island is renting a golf cart. You can cover a ton of ground in a matter of a few hours. Take a drive up to the Wrigley Mansion (Mt. Ada) once owned by the famous chewing gum tycoon family, which has one of the most spectacular viewpoints of the island from the top. You can also take a trip to the lush and beautiful Botanical Gardens which are located in the interior of the island. Wonder Tip: If you want to tour the Wrigley mansion, I recommend making reservations in advance. Golf carting around the island is so much fun! The spectacular view just below The Wrigley Mansion! I met an amazing individual who is a fifth generation native to the island named Billy. He was very informative about the history of the island and gave me some insight that you wouldn’t find on a travel website. He explained to me that there used to be pigs and goats on the island but the Catalina Conservancy (who owns most of the island now) killed all of them as they wanted only animals that were native to inhabit the land. He also gave me a wildflower that the locals call “Sourgrass” because you bite into the stem and it’s extremely sour. It was definitely cool to try it. Last but not least, he explained that most people who visit Catalina have never seen the interior of the island. I told him when I go back, I want him to take me to see it. Wonder Fact: The island is home to several free-roaming herds of Bison that were introduced in the 1920s to shoot a silent film. The houses here are so colorful and the wildflowers are blooming! Should I jump in?? LOL! The water was cold but this dress is hot! Loving the colorful street signs everywhere!